Draft: 2012, New York Mets, 20th rd. Timothy Louis Peterson graduated from Emerald Ridge (WA) High School...Attended Western Nevada College before going to the University of Kentucky for one season...Was voted the All-Area Baseball Player of the Year in high school...Has been playing the violin since he was nine years old...Hobbies include fishing and golfing. Had his contract selected from Las Vegas (AAA) of Pacific Coast League on May 30...Was optioned to Las Vegas on June 14...Also with the Mets from June 19-August 1, August 13-19 and recalled for a final time on September 1...Made his major league debut with 2.0 innings on May 30 at Atlanta...Earned a hold...Picked up his first major league win on June 26 vs. Pittsburgh with 1.0 scoreless inning...Also had a win on July 9 vs. Philadelphia (Game 1)...Right-handers in the majors were 0-fortheir-first-22 against Peterson, the longest career-opening hitless for any Mets pitcher... Courtesy of Elias...Cameron Maybin homered on July 1 to snap the streak...Surrendered eight homers in 27.2 innings (2.6 homers per nine innings)...Had 25 strikeouts...Allowed one run over 9.1 innings (0.96 ERA) with 12 strikeouts from June 1-27...Closed September with 5.0 scoreless frames...Right-handers were 15-65 (.231) and lefties went 14-46 (.304)...Was 0-1 with eight saves and a 3.49 ERA (15 earned runs/38.2 innings) in 32 games with Las Vegas...Had 55 strikeouts for a 12.8 strikeouts per nine inning ratio. April 10, 2019 New York Mets optioned RHP Tim Peterson to Syracuse Mets. March 28, 2019 New York Mets recalled RHP Tim Peterson from Syracuse Mets. 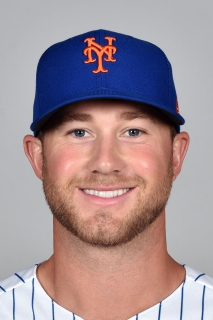 March 22, 2019 New York Mets optioned RHP Tim Peterson to Syracuse Mets. November 19, 2018 Toros del Este placed RHP Tim Peterson on the reserve list. October 13, 2018 RHP Tim Peterson assigned to Toros del Este. September 1, 2018 New York Mets recalled Tim Peterson from Las Vegas 51s. August 16, 2018 New York Mets optioned RHP Tim Peterson to Las Vegas 51s. August 13, 2018 New York Mets recalled Tim Peterson from Las Vegas 51s. August 1, 2018 New York Mets optioned RHP Tim Peterson to Las Vegas 51s. June 19, 2018 New York Mets recalled Tim Peterson from Las Vegas 51s. June 14, 2018 New York Mets optioned RHP Tim Peterson to Las Vegas 51s. May 30, 2018 New York Mets selected the contract of Tim Peterson from Las Vegas 51s. April 3, 2018 RHP Tim Peterson assigned to Las Vegas 51s from Binghamton Rumble Ponies. February 24, 2018 RHP Tim Peterson assigned to New York Mets. October 10, 2017 RHP Tim Peterson assigned to Scottsdale Scorpions. June 22, 2017 RHP Tim Peterson assigned to Binghamton Rumble Ponies from Las Vegas 51s. June 20, 2017 RHP Tim Peterson assigned to Las Vegas 51s from Binghamton Rumble Ponies. June 19, 2017 RHP Tim Peterson assigned to Binghamton Rumble Ponies from Las Vegas 51s. June 16, 2017 RHP Tim Peterson assigned to Las Vegas 51s from Binghamton Rumble Ponies. May 11, 2017 RHP Tim Peterson assigned to Binghamton Rumble Ponies from Las Vegas 51s. May 7, 2017 RHP Tim Peterson assigned to Las Vegas 51s from Binghamton Rumble Ponies. March 15, 2017 RHP Tim Peterson assigned to New York Mets. May 24, 2016 RHP Tim Peterson assigned to Binghamton Mets from St. Lucie Mets. April 6, 2016 RHP Tim Peterson assigned to St. Lucie Mets from Binghamton Mets. July 5, 2015 Tim Peterson assigned to Savannah Sand Gnats from St. Lucie Mets. February 10, 2015 St. Lucie Mets placed RHP Tim Peterson on the restricted list. September 3, 2014 RHP Tim Peterson assigned to St. Lucie Mets from Binghamton Mets. September 1, 2014 RHP Tim Peterson assigned to Binghamton Mets from St. Lucie Mets. August 7, 2014 St. Lucie Mets activated RHP Tim Peterson from the 7-day disabled list. July 17, 2014 St. Lucie Mets activated RHP Tim Peterson from the temporarily inactive list. July 12, 2014 St. Lucie Mets placed RHP Tim Peterson on the temporarily inactive list. June 19, 2014 RHP Tim Peterson assigned to St. Lucie Mets from Savannah Sand Gnats. August 5, 2013 RHP Tim Peterson assigned to Savannah Sand Gnats from Brooklyn Cyclones. June 4, 2013 Tim Peterson assigned to Brooklyn Cyclones from Savannah Sand Gnats. May 29, 2013 Tim Peterson assigned to Savannah Sand Gnats from Brooklyn Cyclones. May 15, 2013 Tim Peterson assigned to Brooklyn Cyclones from Savannah Sand Gnats. April 24, 2013 Tim Peterson assigned to Savannah Sand Gnats from Brooklyn Cyclones. April 19, 2013 Tim Peterson assigned to Brooklyn Cyclones from Savannah Sand Gnats. April 3, 2013 Tim Peterson assigned to Savannah Sand Gnats from Brooklyn Cyclones. June 18, 2012 Tim Peterson assigned to Brooklyn Cyclones. June 17, 2012 New York Mets signed RHP Tim Peterson.